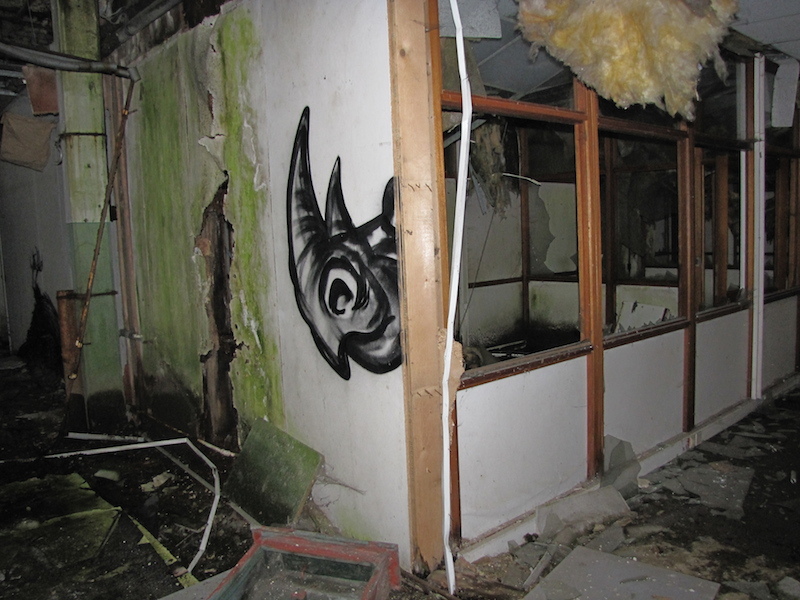 An early piece by Roa in an abandoned building in Belgium. Photo by Massygo. Before Roa began traveling the world painting murals in cities from Melbourne to Chicago, he honed his skills painting in Belgium’s abandoned factories (and eventually the mostly-abandoned Belgian town of Doel). Today, Roa is one of the most celebrated muralists in the street art community and he paints his larger-than-life animals in crowded cities for fans around the world, but his pieces in abandoned places have been seen by only a handful of people. In some ways, painting in abandoned spaces seems antithetical to street art. After all, it is then not art for everyone. But that’s just one way to view the situation. If Roa doesn’t legally have access to the large walls that his work requires and he does not want to make something in illegal in just a few minutes, painting in abandoned spaces gives him time to fulfill his artistic visions. Abandoned places also provide the opportunity for introspective or experimental work that might not be ready for downtown Manhattan. Finally, even though Roa’s work in abandoned factories or in the desert won’t be seen by many, seeing those pieces is a reward for those who take the risks to go out and explore. Roa can now inform his fans of his experiments in abandoned locations. He photographs the work and posts it online. Hundreds of thousands might see the photograph even though few of them will ever hike around Belgium to see those factories in person. It’s certainly something Roa did, which is quite clear if you look through the old photos on his fotolog account. As Roa has shown, it doesn’t matter if it’s street art is in the middle of a major city or in an abandoned building in rural Belgium. As long as the artist takes a good photograph and distributes it, well, people will see the work and share it with more people, if it’s any good.